For my work experience this year, I have been lucky enough to have Matt Smith, a freelance consultant ecologist and expert on bees, take me under his wing for a couple of days of pond and reptile surveys. I went with him to learn about that kind of work that somebody in an ecological mindset could find, and I was not disappointed. 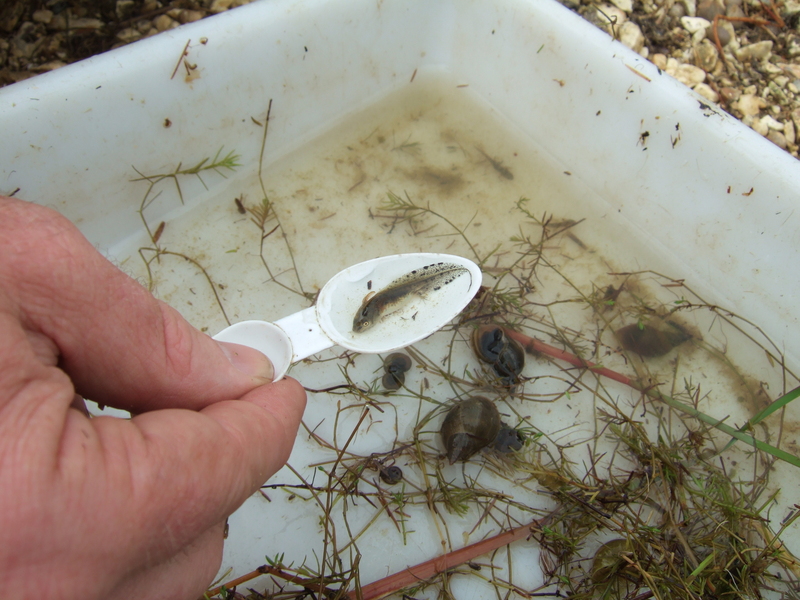 Over our time together, we thrashed ponds to find what kind of invertebrate life we could find, discovering dragonflies, water spiders, pondweeds and even newts. Its really amazing finding out what kind of animals live in the little bodies of water so close to home, and the breadth and depth of Matt’s knowledge on the subject was astounding. We tramped through heathland after elusive lizards, instead finding birds and beetles, and we peeked under carpets in search of slowworms and snakes. It was one of the most exciting experiences of my life, and it gave me a great insight into the sort of work that may be available to me in the future. I’m deeply thankful to Matt for giving me this wonderful experience. While performing a reptile survey in Snelsmore Common, Matt and I saw many signs warning us about the presence on ground nesting birds on the site, and the dangers of disturbing or damaging their nests. 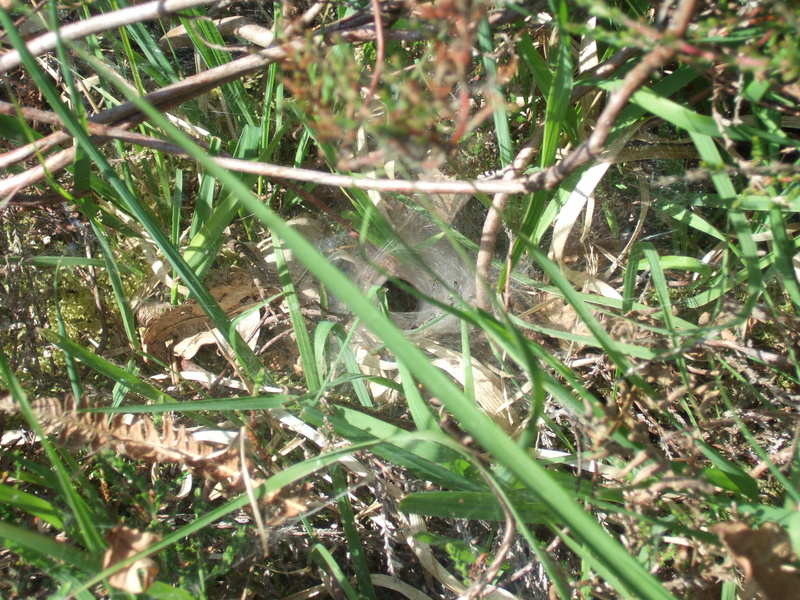 We had been walking around the Common, hunting lizards, and spotting spiders for several hours, and we were starting to suspect that there were no ground nesting birds here at all. However, as we approached the end of our day, and were making a last trip around the north of the Common, a small brown bird squawked under my feet and flew into the air. The bird and it’s nest had been camouflaged so perfectly, neither of us spotted it until we were almost on top of it. The nests of ground nesting birds are set into the earth, where there is lots of grass and leaves to cover them, in order to hide them from predators. Typical eaters of eggs like these, include Crows, Red Foxes and the American Mink. They can also be trampled by larger grazing animals such as horses and cows, who don’t notice the nests until they are crushed. Due to the decline in heath areas where birds like this can hide their nests, which are cut away to make cattle land and crop fields, it is important to protect these birds wherever possible, and several laws have been passed preventing people from disturbing these nests. 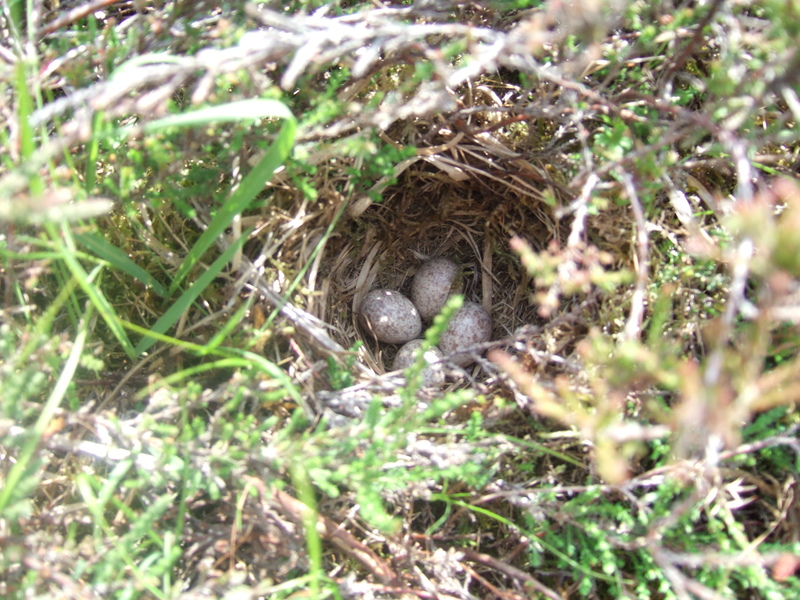 The eggs of ground nesting birds are often brown and speckled, whereas it is much more common for high nesting birds to have bright blue or white eggs. This is because high nesting birds rely on the safety of the tree for protection from predators, while the ground eggs need any extra camouflage they can have. Judging from the number and size of the eggs in the nest, these are likely Chaffinch, which live in the area. Unfortunately, I am not an expert in Oology (the study of birds eggs) and I can not be sure of this. There is a huge variety of such birds in Britain. After the bird had flown off, and Matt and I had recovered from the shock of it’s unexpected squawk, we made sure nearby horses weren’t going to trample it, and moved away. The parent bird would return as soon as it was sure we had left. 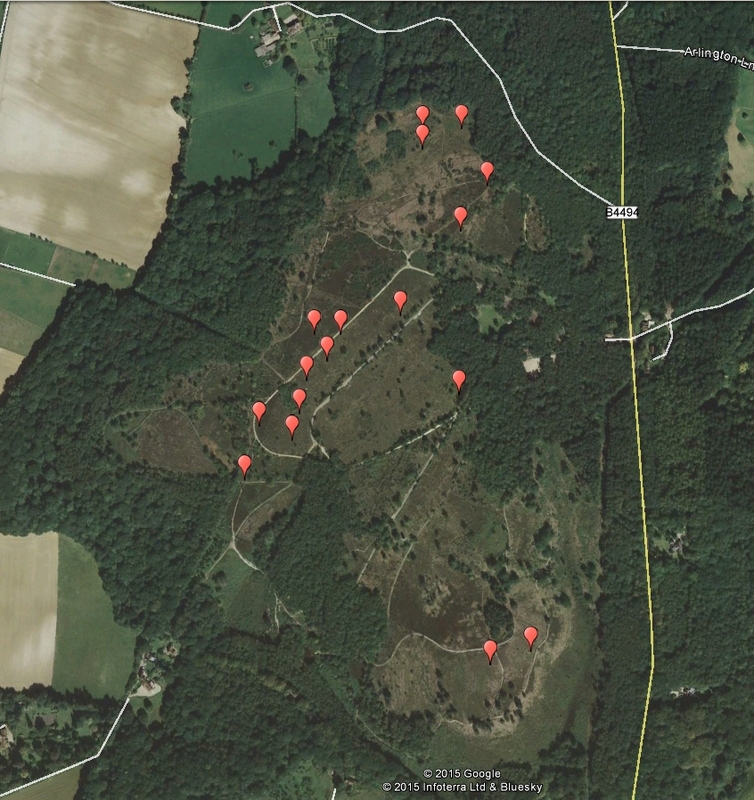 This map of Snelsmore Common shows all of the points where Matt and I saw common lizards. 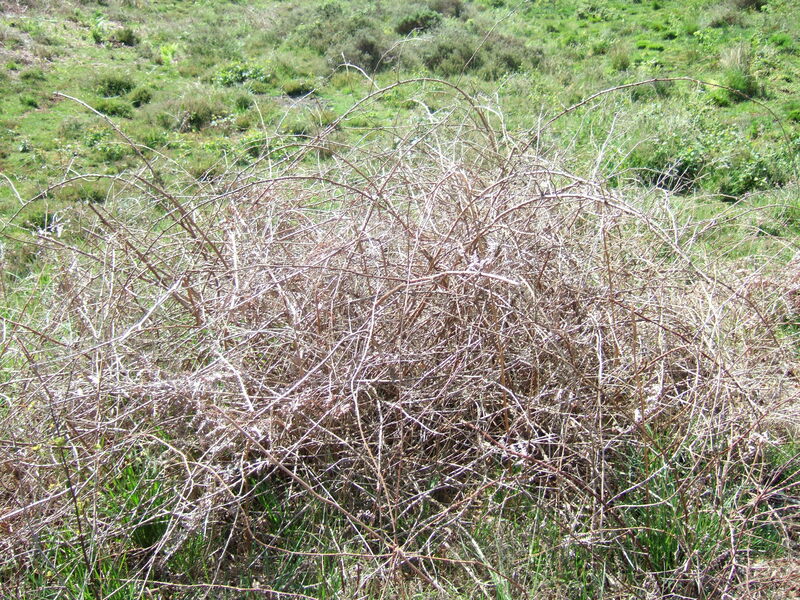 Notice that there are not many in the south, where scrubland is rarer. On the second day of my work experience with Matt, we went to Snelsmore Common in order to survey the reptiles that were supposedly living there. There had been previous reports of Common Lizards, Slowworms, Grass Snakes and even Adders living around the common, and Matt and I needed to find out where each species was living, and how many of them there were. The only way to perform a reptile survey like this is to walk around the area that you are surveying for several hours, slowly looking to see what you can find, and noting down it’s position. 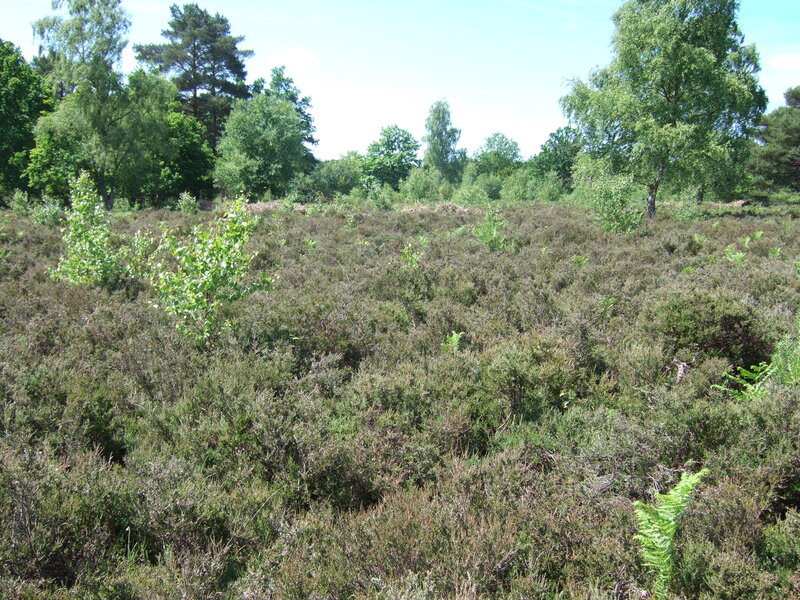 After a quick look at the map, Matt broke up the Common into three sections: the flat southern section, covered in gauze bushes and deforested land, the west and centre area, filled with various heathers, and the rougher northern section, with longer, uncut heathers. We ignored the forests, since reptiles tend not to live in wooded areas like that, preferring the low bracken where they can get a lot of heat from the sun, while still staying close to cover. 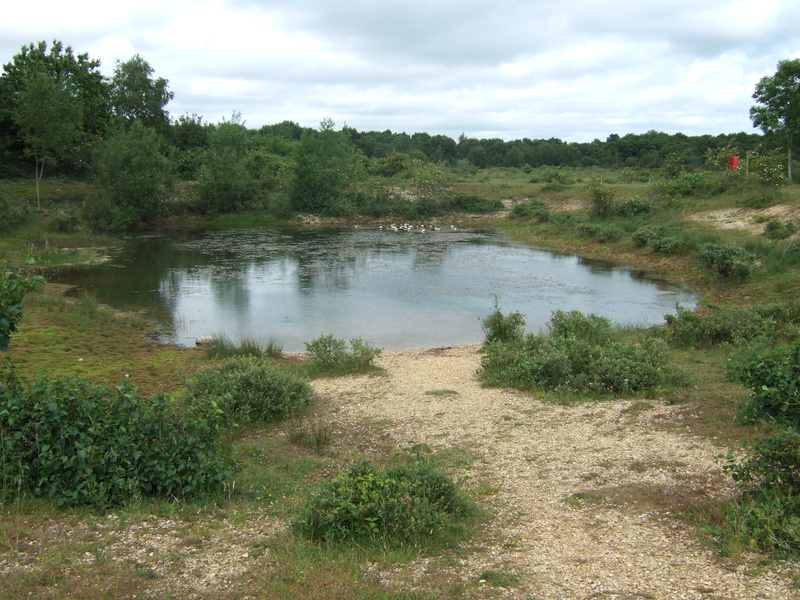 In the southerly section of the Common, there where very few reptiles could be found, except for the occasional lizard, there was very little heath for reptiles to hide in, since the whole area had recently been deforested. In order to control deforestation in this protected area, different sections are cut down for different harvests, meaning that the rest of the woodland has time to recover before more wood is needed. Another way in which this protected land is being sustainably used is grazing of Highland Cows. These cows are much closer to the pre-domestication wild cattle than the black and white cows we have today. As a result, they are far less picky with what they eat, munching on bracken and fern as easily as grass. This means that cattle can be raised in this area for human benefit, without cutting down the land for grazing space. In the north and western areas, there was plenty of scrub for lizards and snakes to hide in, but the lizards that we did spot were to fast to photograph, leaving me sadly without any images of them. The heathers were taller here, and large piles of twigs were dotted about the landscape, the perfect places for adders to be hiding. The diamond crisscross camouflage on the adders back, helps to break up the outline of the adder, when it is amongst bracken. While still, it is very difficult to see a hidden adder, and so you must watch your step while in areas adders might live. Unfortunately, we did not see any adders, although I thought I saw the tail end of a large, brownish snake disappearing into the bushes. Since adders often remain in the same territories, we staked the bush out for several minutes, but the mystery snake did not return. We noted down where it was so that Matt could return another time. In the day we had 16 lizards siting across Snelsdon Common, and one possible adder. This days was mainly about finding out what the Common was like, and where the reptiles where living. Matt will return to the Common several more times before he concludes this Reptile Survey. 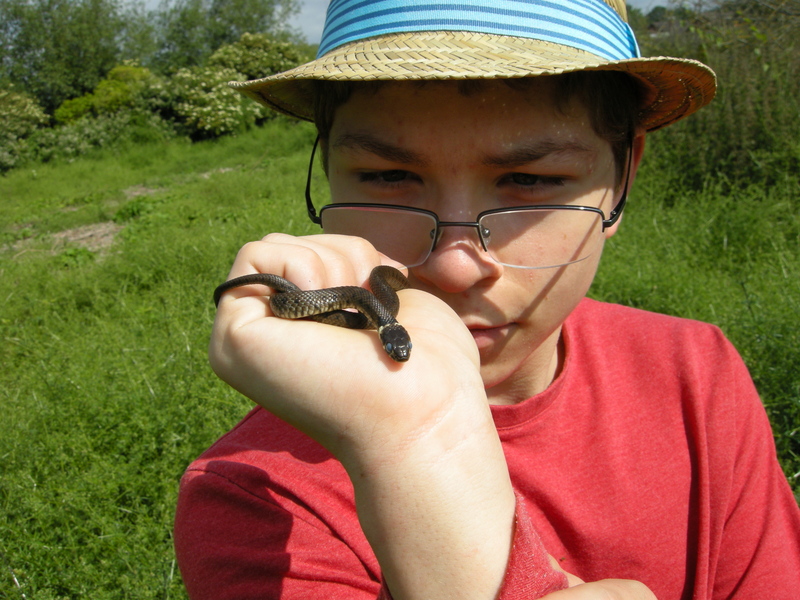 On the second day of my work experience with Matt, we went to do a reptile survey near Maidenhead. The area was due to be turn into a bowling green, but before the developers could begin construction, they needed to have a reptile survey done in order to determine how many reptiles were living there and whether or not they needed to be relocated first. There had already been reports of Slowworms in this part of Maidenhead, and so it was Matt’s job to find out what was living here and how many. 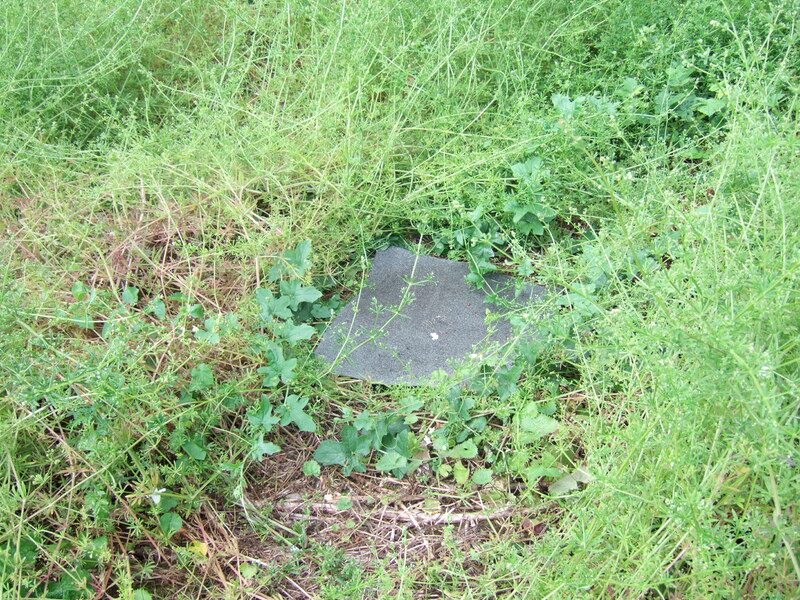 Matt had already placed out pieces of roofing felt, like the one above, in order to attract reptiles that needed cover and a place to warm their bodies. We went on Matt’s fourth trip to the site, hoping to find around 8 – 12 slowworms hiding in the grass, as well as the (somewhat legendary) silver grey slowworm Eric, a large male with fairly rare blue specks, named by Matt. At first, the only thing that was hiding under the roofing felt were colonies of ants, which crawled onto our arms, and left us with little irritating bites. However, on the fourth piece of tarp, we found a small female, whose gender we could identify by the brown stripe running down her sides. Overall we found 10 of the legless lizards, including a beige juvenile and a large dark brown male, pictured below. Unfortunately, the illustrious Eric did not turn up today, but we did find another unexpected visitor underneath the tarp. As I reached down to scoop up a lizard for a better look, Matt waved me away. He had spotted the dark form of a snake underneath the grass, and for a scary moment had thought it an adder, waiting to lash out at my unsuspecting fingers. Upon closer inspection we found that it was a young grass snake, only just turned mature. It’s skin had turned almost completely black and it’s eyes where milky instead of clear, because it was ready to moult its old skin. The black scales would soon fall away to reveal new brown-white scales. The two large scales kept over it’s eyes to protect them had begun to lift away, causing them to fog up with the cloudy colours. It was fantastic to see. We returned all of the roofing felt to it’s original place, and moved on to the next part of our day. Matt would have to return to this site another three times before his survey was complete, and then pass on the results to another ecologist for assessment and relocation. Matt and I needed to thrash this churned up pond during my work experience with him, and we found a wealth of interesting life hiding in the rising silt of the pond. Grazing animals such as cows and sheep often come into ponds like this to bath and drink, and as a result a lot of grit and animal faeces are stirred up and reveal some interesting life near the pond floor. We located two major habitats within the pond that we needed to thrash, one of which was the clear bank nearest to us, where we could see pond skaters and whirligigs Whirligig beetles are small predatory beetles that skim on the surface of water, and use a collection of air bubbles they carry around with them, in order to dive and catch small invertebrates. They get their peculiar name from the unmistakable circling pattern they make when moving on the surface of the water, which is reminiscent of the spinning tops that they are named after. On the left and right sides of the pond, where there was more aquatic vegetation, we found smaller water beetles. 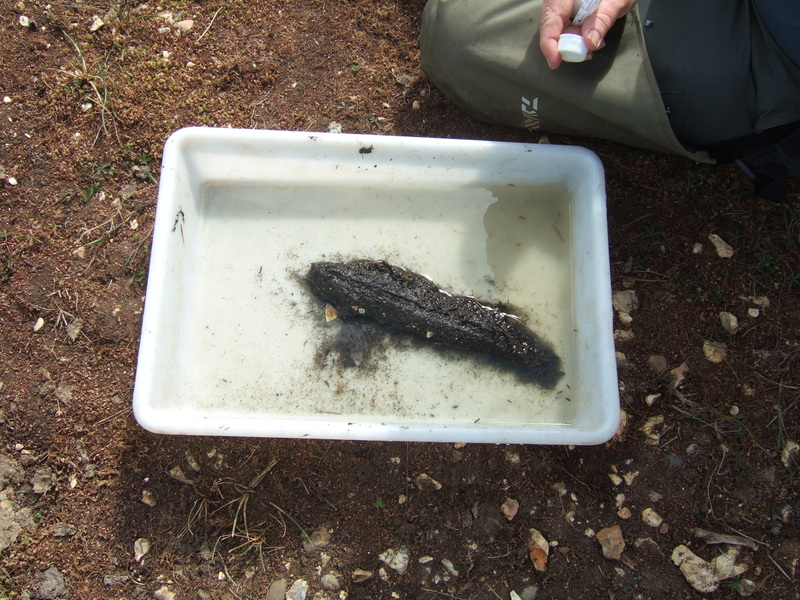 The water was murky from the silt, making it hard to see anything below the surface, and Matt had to wade in quite deep to find any of the dragonfly or mayfly larvae, or to pick leeches off the surface of the sedge and pondweed. Thrashing this area was harder than the first, since we could not properly see where the weeds were below the surface, and they dragged into our nets. Despite this, we found a number of beetles we had not seen in any pond that day, and collected them to be dissected to identify their exact species. 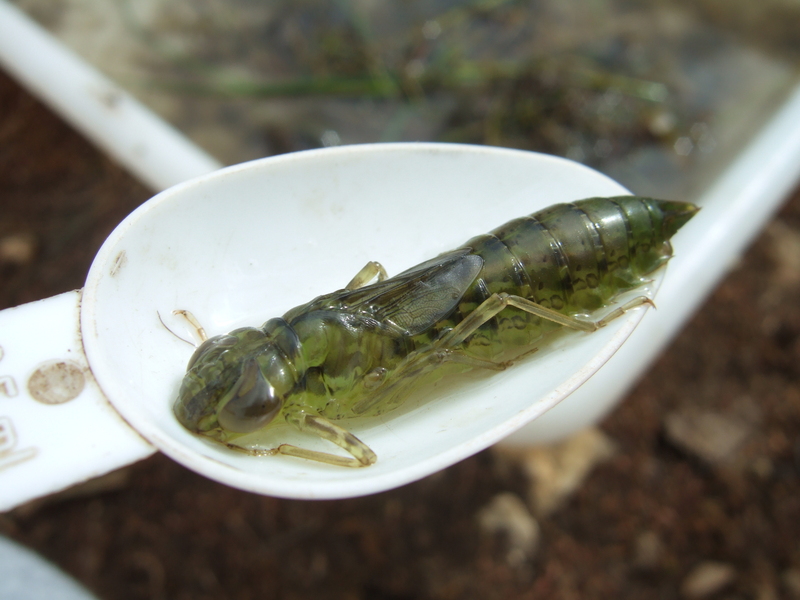 After thoroughly thrashing the pond for about an hour, Matt and I found water boatmen, water skaters, whirligigs, a nasal leech, emperor dragonfly larvae, mayfly larvae, caddisfly larvae cases, many small water beetles and bloodworms. 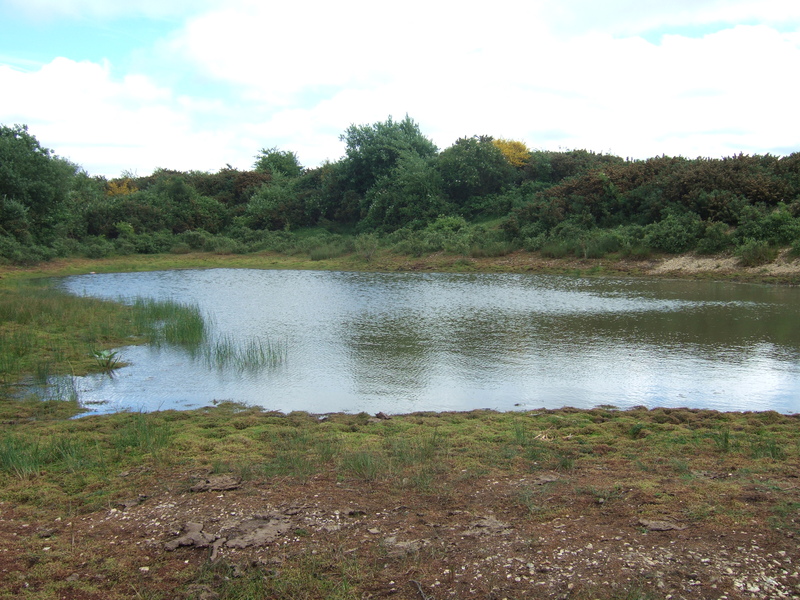 The pond can be considered fairly productive, with a healthy foodweb, although it is likely that grazing animals wallowing in it has had a large effect on the ponds diversity. While thrashing a pond full of newts on my work experience with Matt, we found an adult Palmate Newt hiding in the pondweeds nearby some common frogs. It is the smallest newt in Britain, 6 or 7cm smaller than the enormous Great Crested Newt, is common throughout West Europe, although it is actually extremely rare in Belgium and Holland. Palmate Newts are normally brown or pink in colour, with a slightly darker banded stripe across their eyes. They can have dark spots on their backs, but never as many as a Smooth Newt, and not as dark as those of a Great Crested Newt. Males possess webbed back feet, as well as a slight, smooth crest that will develop during mating season, which is around April. These newts will eat most invertebrates smaller than them, crustaceans like freshwater shrimp, water fleas, frog or toad tadpoles, and occasionally, they will eat each other, making them the only cannibalistic newt in the UK. Palmate Newts only hunt at night, when the air is full of water, or the ground is particularly damp, spending the day and unsuitable nights underwater or beneath moist logs and stones. During the breeding season, the newts will also become active during the day, since they need to attract a mate and hunt. The newt Matt and I found was a young female, and in relatively good health. We noted that Palmate Newts were present in the pond, and then moved away from where we found her, so that we wouldn’t disturb her and the other newts in the area again. While thrashing an amphibian infested pond with Matt on my work experience, we found a large colony of rare great crested newts living by a bank of water mint. Of the three species of newt that live in Britain, the others being the Common and Palmate Newts, the Great Crested Newt is be far the largest and the rarest, measuring at around 15cm long, over 5cm longer than other British newts. The GC Newt, or Triturus Cristatus, can be recognised by the dark blotches on it’s body, which are unique to each individual, and the yellow or orange underbelly. Males also possess a silver or grey stripe that runs down their sides. During mating season, males will develop a large jagged crest, leading from the base of their head to the start of their tail, and a smoother crest along the whole of their tail. This crest is used to attract females to mate with. Great Crested Newts mate during February and early March, and lay a couple of eggs every day from March to June, until roughly 250 eggs are produced. Eggs are normally placed on the leaves and branches of aquatic plants, such as the water mint in the pond Matt and I thrashed, and wrap the gently so as to protect them. The eggs hatch after about three weeks, creating a new batch of newt poles. The young are vulnerable to larger predators, such as fish or leaches, and so the adult newts normally lay in relatively safe ponds, avoiding rivers or lakes. After four months, the newt poles are able to leave the water and breath air, and after 2 or 3 years, they are ready to breed. A Great Crested Newt will live for about 10-15 years in the wild, but one newt has survived 28 years in captivity before dying. Throughout Europe and in the UK in particular, the are numerous restrictions on what you can and can’t do with these newts. 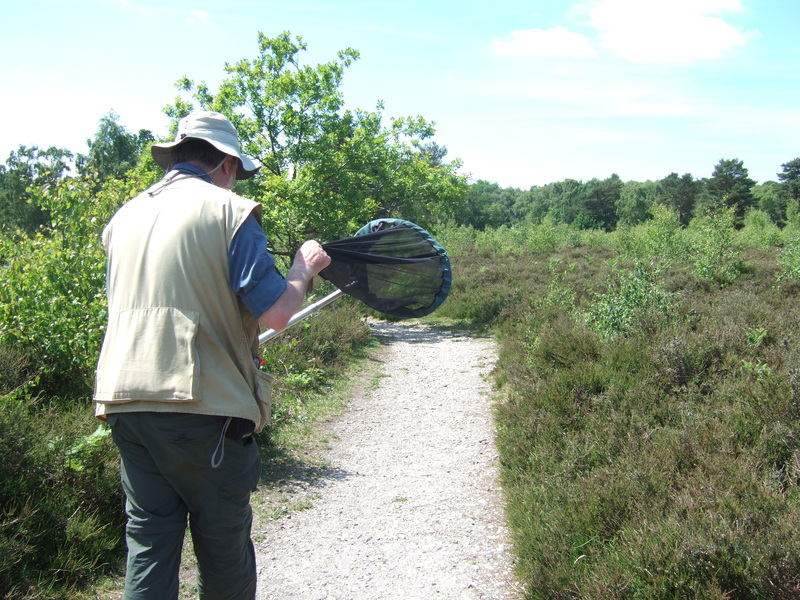 They are heavily protected, making it illegal to harm, keep, disturb or move one of these newts without the correct licence and the permission of the National or Wildlife Trust. Luckily, Matt and about 2000 others in the UK possess this licence, so we were able to carefully go about our work in the pond without harming the newts. While pond thrashing on my work experience with Matt, we went to a pond that was filled with numerous amphibians, such as frogs and newts. It had been listed as a fishing pond on the map, and the water was filled with healthy British plants, all of which point towards a diverse and productive pond. Upon reaching the pond, we could hear the croaking of marsh frogs, which are a non-native species, and shouldn’t have been in the pond. The most likely reason for their presence in this pond is that someone had them as pets, and chose to get rid of them by dumping them in a nearby pond. They are part of the genus Pelophylax, which contains the ‘green frogs’ of the Old World. We searched the pond’s banks for the different areas that we’d need to thrash for invertebrates, and found a few separate habitats. On the close bank, it was all open water, with few pondweeds and many larger snails floating in it, such as greater pond snails, and ramshorn snails. Water beetles and other smaller invertebrates lived in this area, with most of the larger, carnivorous invertebrates living deeper in the weeds. On the left bank, there is a thicket of dense water mint, and lots of pondweeds in the water next to it. This is ideal habitat for newts, as they have covered areas to hunt and hide, as well as the large thicket of water mint, which is ideal for newts to lay their eggs on. 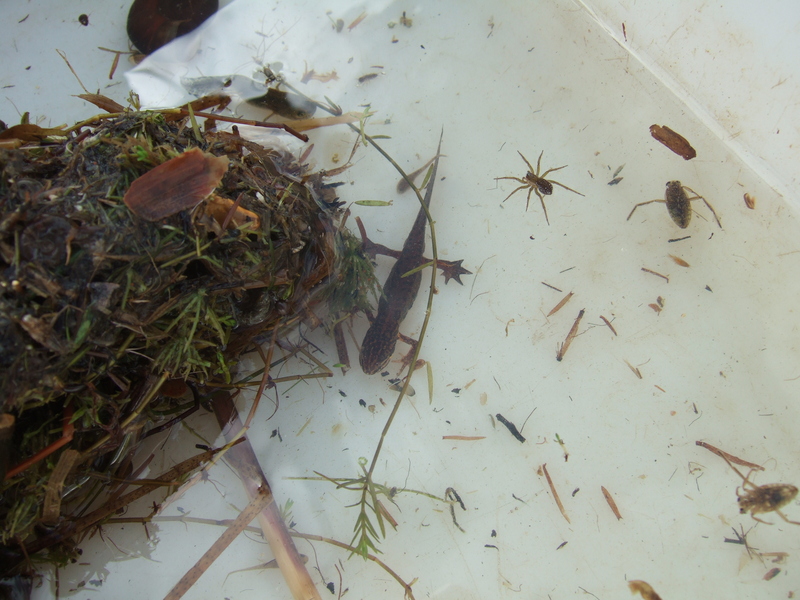 We found two kinds of newt in the pond, including the rare and protected Great Crested Newt, which prevented us from disturbing that area of the pond further, to avoid agitating the newts. We also found a full grown Palmate Newt and a Common Frog and it’s tadpole hidden in the weeds and on the bank. On the far bank, there is an area of deep water, which can be seen by the lilies, which will only grow in places where the water is deep. The marsh frogs that Matt and I heard earlier jumped off of the bank and into the pond as we came past, although none of them sat on a lily pad. Thrashing in this section was fairly easy, and we found a good number of frog tadpoles and larvae. Matt and I thrashed the pond for nearly an hour before we stopped. We had found a large number of amphibians and invertebrates, including water boatmen, caddisfly larvae in their cases, mayfly larvae, dragonfly larvae, damselfly larvae, various small water beetles, water skaters, greater and lesser pond snails, ramshorn snails, palmate newts, great crested newt tadpoles, common frogs and marshfrogs. This was an extremely healthy and diverse pond, with numerous predatory vertebrates, many specimens of smaller invertebrates, and abundant local flora, such as the water mint. A gravel pit pond that I thrashed with Matt on my work experience was almost completely choked by New Zealand Pygmyweed, or Australian Swamp Stonecrop (Crassula Helmsii), an invasive species of pondweed that came in from abroad, and has taken over numerous British ponds, especially in south and midland England and most of Wales. 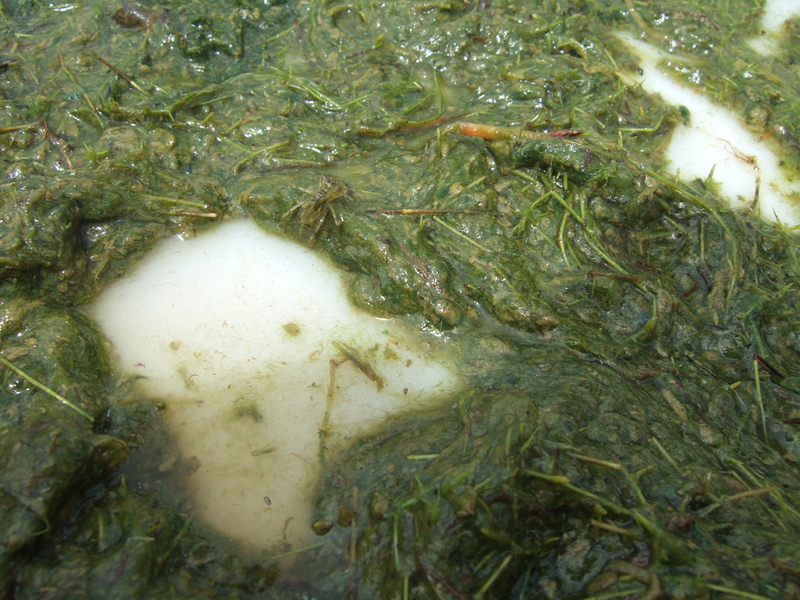 The pondweed is particularly adaptable to it’s environment, being able to survive in both acidic and alkali conditions without detrimental effects, as well as surviving in semi-saline areas. As such it is able to grow in almost any body of still or slow moving freshwater it is introduced too, and often destroys the local subaquatic flora. This often leads to oxygen depletion within ponds, and invertebrates, fish and amphibians can quickly die out. The Crassula in cannot create viable seeds in Britain, meaning that it must reproduce entirely through cuttings. The Pygmyweed can grow from a piece of leaf or stem as small as 5mm, which means that you must be very careful when fishing or surveying in a pond with Crassula in, so that you do not bring pieces of it to another pond which is not infested. This trait also makes it incredibly difficult to remove from habitats it has already taken over, and to this day it has not been successfully removed from any area. Matt and I made care not to bring any of the New Zealand Pygmyweed with us when we went to the next pond, cleaning our nets, and the tray we used to search for invertebrates. Even a small piece of Crassula could have taken over another pond.